“How does the dip get such a smoky taste? 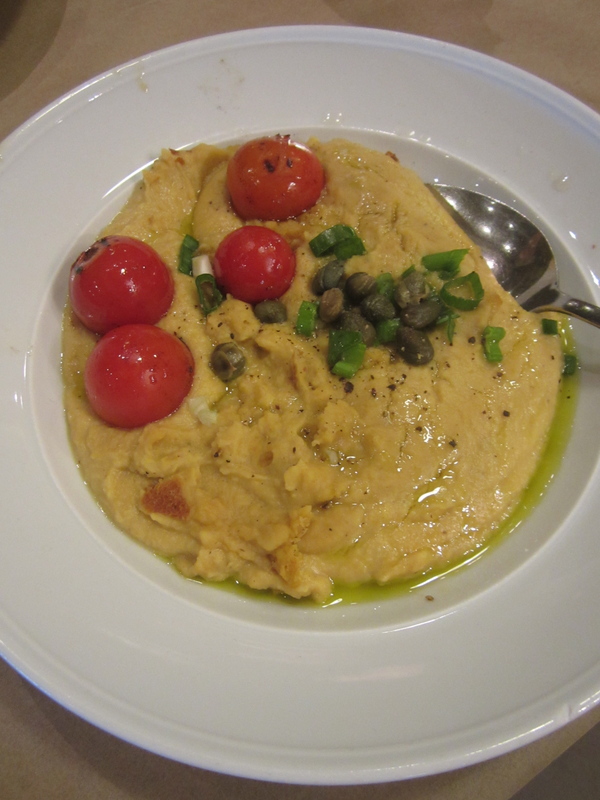 How can you mimic this at home?” I ask, baffled at how delicious simple things like eggplant dip, yogurt, and fried zucchini taste in this country. Last week, I turned 30 – and one of my birthday gifts was a trip to Thessaloniki to meet family friends and eat our way through town. The French fries are sprinkled with oregano. The cheeses are all names I’ve never heard of (except, of course, for the feta and halloumi) and are served baked with tomatoes, fried, or covered with sesame seeds and honey (we ordered two of those…) The smoked mackerel with red onions has the same deep wood flavor as the eggplant dip – not like the peppery kind I buy at home in Paris. 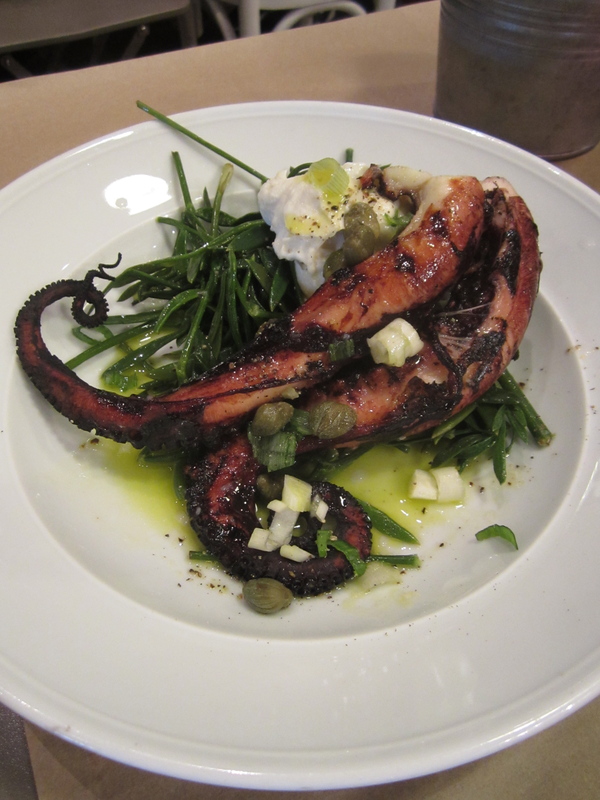 “What is this white stuff with the octopus?” thinking it was a sort of a labneh, the Lebanese cheese spread – the waiter looked at me and replied with a simple shrug. “It’s yogurt.” I had imagined I’d be wowed by the yogurt in Greece but this exceeded my expectations. In one of the food markets, a sweet street dog sleeps in front of a stand of salt cod. In another, fishmongers shout prices of neatly presented octopi – the legs rolled under the bodies so that the carcasses look like sweet seafood flowers. 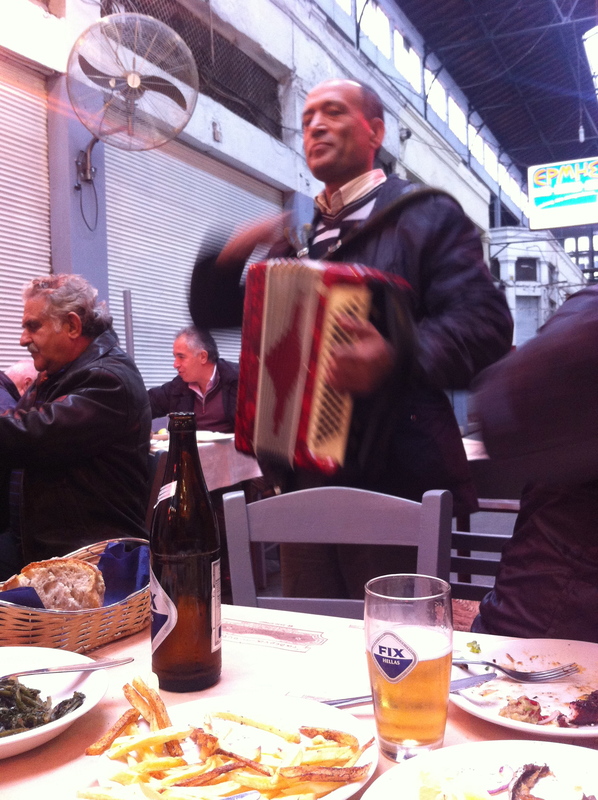 Lunch in a market fish tavern brings a spare guitar; a bourgeois-looking man who could be a city council member takes up the opportunity to play with an excellent errant accordion player. 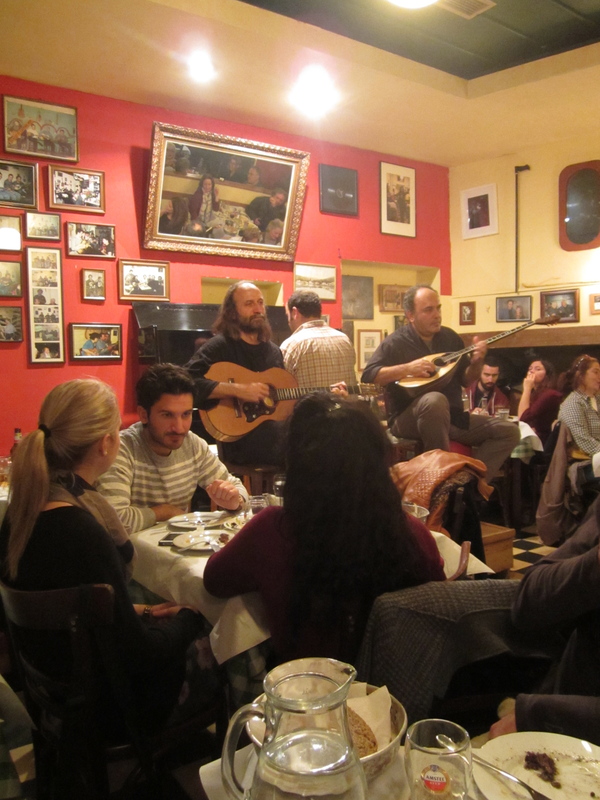 The other diners sing along to well-known Greek folk songs. During the day, we climb narrow cobblestone graffiti-ridden streets to the castle at the top of the hill. 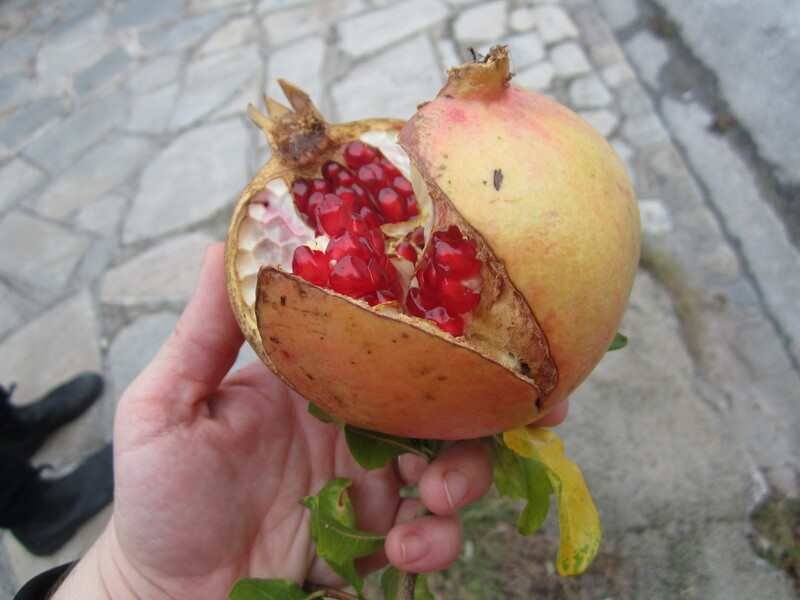 I admire the pomegranates bursting from trees on small front lawns of colorful urban homes. Each tree I see, I hope to spy a fruit that I can pick without a ladder. Finally on a small square there is a public tree – with fruits so ripe they’ve burst open on the branch. I climb, grab my prize, and snack on it the rest of the way up the hill. 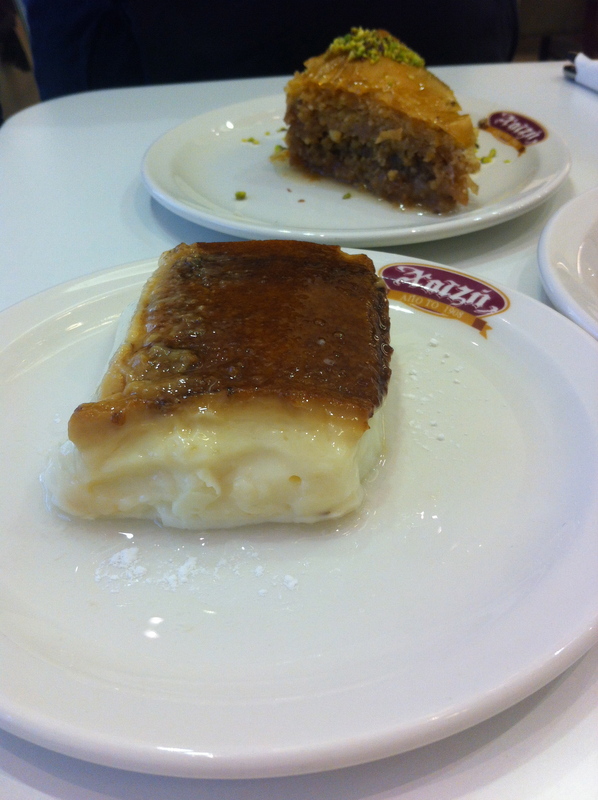 The icing on the cake was a Sunday morning post-hotel-breakfast treat at Hatzis (http://chatzis.gr/), one of the city’s famous pastry shops, for a buffalo milk and rosewater custard. “I can practically taste the grass the buffalo must have eaten,” the flavor is so surprising and unfamiliar to me. 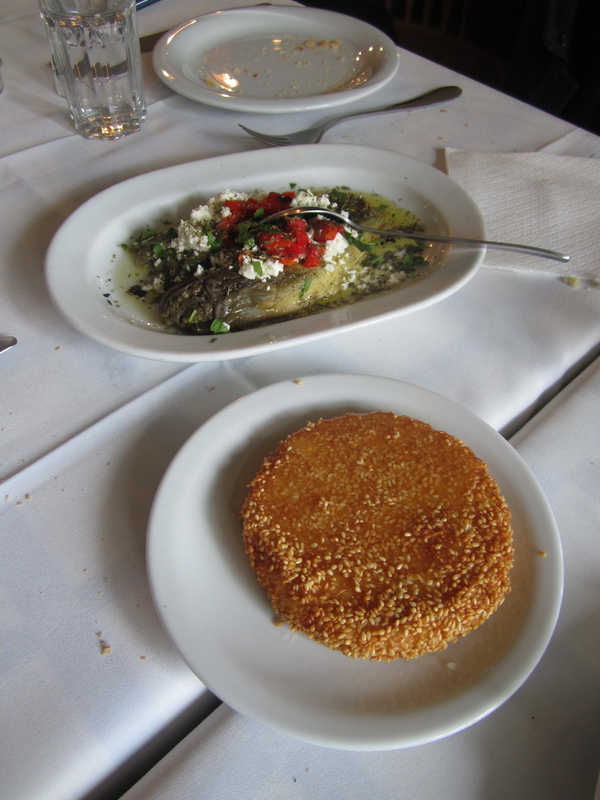 This entry was posted in Uncategorized and tagged epicurean, greece, pomegranate, thessaloniki, travel, travelogue by Jennifer. Bookmark the permalink. Such fun ready. Feel like I was with you.